If you are in the market to buy a home and find one that checks off most of your “must-haves” list, you may want to go ahead with the purchase. First-time home buyers can be at a disadvantage since they put most of their available cash into a down payment and closing costs. This forces them to “live” with a less than perfect home and puts them back in a save to change situation. Enter the FHA 203k mortgage solution. This mortgage product allows a borrower to buy a home while providing additional funds for improvements to be done. 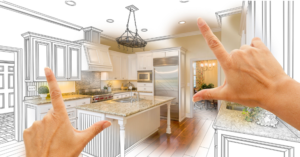 Types of renovations included are kitchen and bathroom remodels, new flooring, plumbing, heat and A/C systems, room additions plus other major improvements. This allows a buyer to consider a home that might needs repairs and would not be acceptable to purchase without this type of mortgage. However, as an FHA loan, a minimal down payment is required, reasonable interest rates and generous qualifying requirements. The 203k Streamline can be used for cosmetic improvements, appliances and minor remodeling up to $35,000 in cost. Be aware, this is a specialized program and not every lender can make a 203k loan. This will take longer to process, and you will need to get firm bids on the work to be done. It is important to know if your lender has experience with this loan product before you see them. It will also be required that you work with a 203k consultant in addition to the mortgage officer. For more information, go to Hud.gov. FNMA has a similar conventional loan program called HomeStyle Mortgage. As a real estate professional, I can help with recommendations. Call me at (703) 303-4010.